A chauffeur service will collect you and drop you directly adjacent to the check in at the airport. This is lovely, and the same as the service you receive in Business Class. A dedicated check in with no queue and a red carpet is a given. I understand in Abu Dhabi they go all out with a seated area like an upmarket hotel reception, but in Sydney it’s the standard premium cabin check in service, done well. Abu Dhabi is a whole other story……I think my flight must have been the first one in for the morning as we are the first guests to arrive in the dedicated First Class lounge. Staff are everywhere to take our jackets and bags (stored away in proper wardrobes with doors. There seems to be one chap whose whole job is to tend the wardrobes and hang up the jackets.) Rather than have to lower onself and approach the bar for coffee or a drink a waitress circulates to take our orders for drinks. A good coffee is promptly served with a delicious chocolate to accompany. A beautician comes around offering free 15minute treatments in the Six Senses Spa within the lounge, and I decide to indulge and book an eye treatment – and oh, my word, what a treatment! I’m not sure what they do in that Spa, but after 15minutes I walk out floating at the cruising altitude of one of the planes. A pot of ginger tea and a warm cloth for my shoulders completes the job. Bliss…….. Unfortunately, I don’t eat in the lounge – the layover was too short and the food on the plane too good, so I don’t indulge. Suffice to say, in the First Class lounge there is no buffet – you sit down at proper tables and chairs and are served, restaurant style. All in all, the lounge service is a winner, with the only negative being the wifi not working. 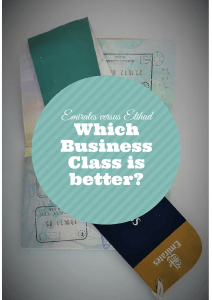 OK, so this is the really important bit – I’ve flown Etihad Business Class a number of times, so am keen to know what my extra money gets me and whether it is worth it. I have to say, a resounding – yes, most definitely! 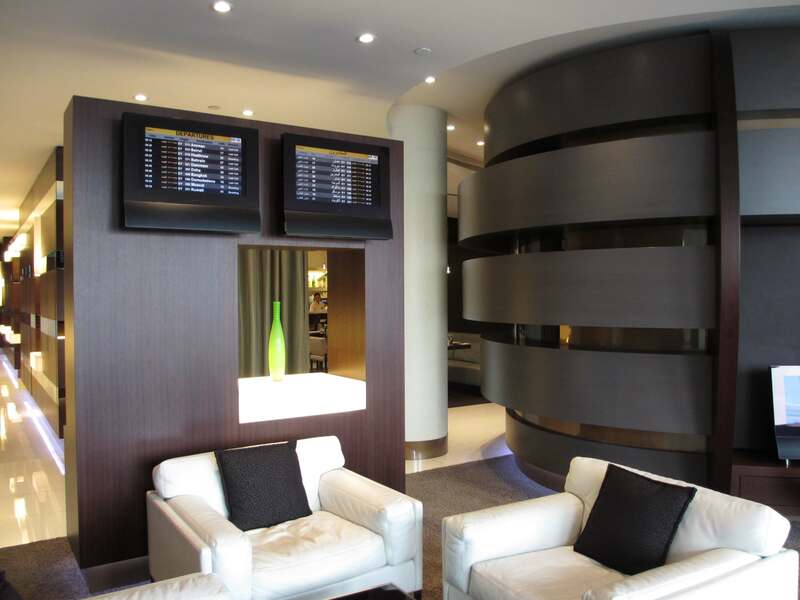 The whole service is built around the idea that you in a flying hotel – you have a suite, with a wardrobe and minibar, a seat for visitors, and a big flat screen TV. The service is attentive and professional, as one would expect. A card welcoming you onboard from the Flight Manager is a nice touch as is the welcome box of chocolates. 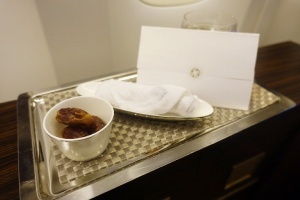 A welcoming cup of Arabic coffee accompanied by fresh dates in addition to the usual champagne makes a nice pre-takeoff touch. Once we are airborne amenities kits (with La Prairie cosmetics) and cute pyjamas (actually cut for a woman) and slippers are handed out. There are two toilets – one standard size one and another double size one which is great for changing into the pyjamas. The Suite: firstly there is no overhead locker. Your carryon luggage slides under the visitor’s seat opposite your seat in the suite, and a carry on case fits perfectly if it is regulation size. Other bags need to take potluck whever you can find room. The wardrobe is a good idea, but in reality is too narrow to do anything much with. My trench coat fitted, but it was hard to hang it on the hanger due to lack of width – I would hate to have an overcoat or be a man with a large hand. The minibar has some nuts etc and a bottle of water, but is not refridgerated – I get my water nice and cold from the flight attendant instead. When it’s time for a sleep the flight attendant makes up your bed with a fitted sheet, a pillow (with crisp cotton pillowcase) and a sateen quilted duvet (which replaces the woollen blanket that come standard when you board). Then it’s time to shut your suite doors and waft off to sleep – which I do, for hours, and it is just like a single bed in a hotel. Wake up time and everything is whisked away and you are back in day mode. The food: First Class comes with an onboard chef. I thought this was going to be a gimmick, but in reality, I liked it. There are two menus – a standard menu of items (including an Arabian themed meal of tasty middle eastern foods) and the Mezzoun Grill menu which is a grill service of lighter choices. 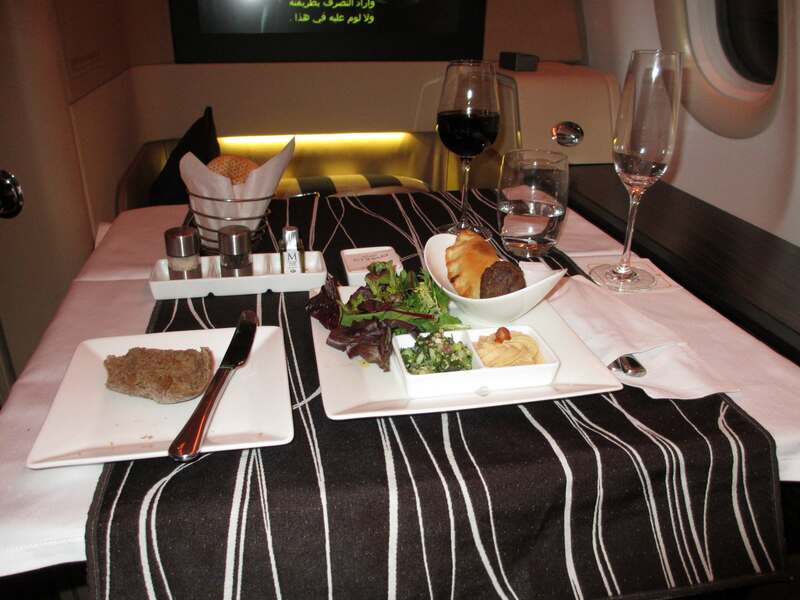 On the “short” leg between Abu Dhabi and Paris I wasn’t overly hungry – the chef made me a really light grilled chicken with a nice salad and without any fancy dressings – just good simple a la carte food. Each meal was of restaurant standard, tasty with the serving size just right. 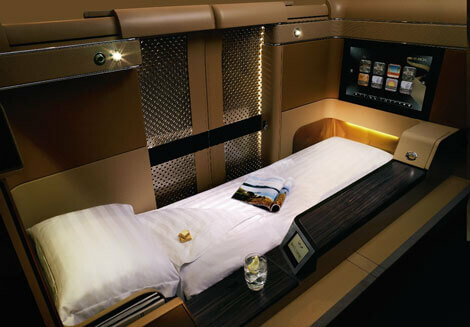 I give the Etihad Diamond First Class a 9 out 10. I would like some extra storage room for my handbag etc, and the wardrobe and minibar are a bit of a gimmick and just not that functional. But, the experience is a fantastic one, the food is excellent and the service both on the ground and in the air is lovely. Apart from the storage, the suite itself is spacious. The bed is comfy and the pillows nice and soft – and isn’t that just what you want from any hotel – even one at 30 000feet! Disclaimer: the author booked and paid for her own ticket for this trip. All photos by the author unless identified otherwise. Thanks for posting/ sharing. The Far East and Middle East airlines are miles and miles ahead of the Western based airlines when it comes to First Class. I love the BA First But there is no comparison. Clearly the Western lines need to ramp up their game! I am really keen to try this airline and Singapore First! Hi Gary, yes I agree about the Asian and Middle Eastern Airlines. I recall reading your post on BA First a few months ago, and I did sound very impressive. 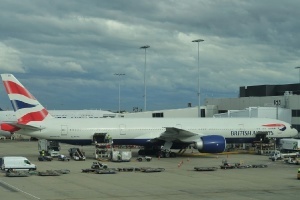 BA often price well to Europe for us here in Australia, so they certainly make another option. I’m very fond of Etihad and also really like their business class, but just don’t get me started on their alleged alliance with Virgin Australia which is a farce! 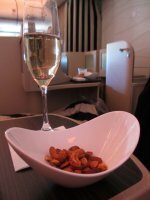 I travelled first class with Etihad London to Sydney with a stopover in Abu Dhabi two years ago – the entire experience was fantastic, relaxing, peaceful and not at all what I expected as this was my first ever First Class flight. The staff were wonderful, and very attentive without being annoying. The meals were superb and I was well cared for when I suffered a terrible migraine mid flight and needed some emergency assistance to rid myself of the pain – they even called in the paramedics on landing at Abu Dhabi… I was very embarrassed at all the fuss, however I did feel well looked after. The second leg of the trip was just as wonderful and I arrived in Sydney refreshed, well fed, pampered and happy. It’s always good to hear that other people have had a similarly high quality experience. 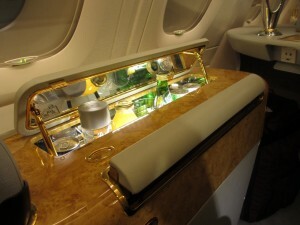 I’m in the middle of a trip at the moment where I’ve travelled Etihad business class. I’ll be posting a review shortly, but it is also very good. Sounds fabulous and one for that special occasion, but you’re dead right the Asian / Middle Eastern airlines are giving Europe a run for their money and it shows! Yes, they certainly do. I should have an update on this post up in the next 24hrs. Working on it as we speak! Dang man, I could never afford to travel like this! Looks real nice though. What a lovely review – definitely worth looking into! Yes it’s a real treat.